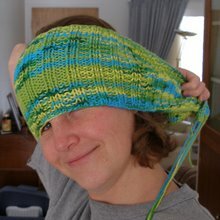 I've been reading Heidi Swanson's blog for years. And I've been cooking from her book Super Natural Cooking for even longer. 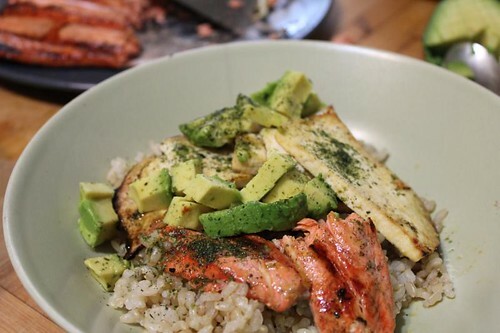 And this recipe, her sushi bowl (with a few minor changes), has been in our weekday meal rotation the entire time (though, funnily enough, it was my brother in law who originally found it online, right as I was becoming smitten with her cookbook). We have it at least once a month, if not more. Not only do the kids love to eat it, but it's also a great recipe for them to help make. My nephew Kam (4 years old) especially loves to help with the oranges. 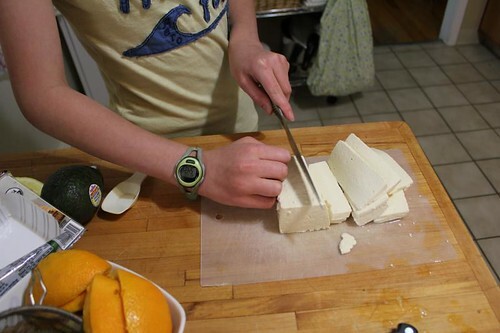 When I started to make it for dinner last week, Joey offered to do all of it herself, if I took pictures of the process. 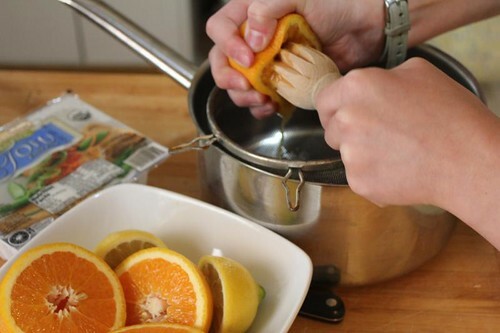 -Halve and ream out all the citrus through a strainer into a saucepan. The original recipe has you first zest them (and add the zest after the sauce has cooked), but Joey prefers it without the zest and she was the one making dinner. Do as you see fit. 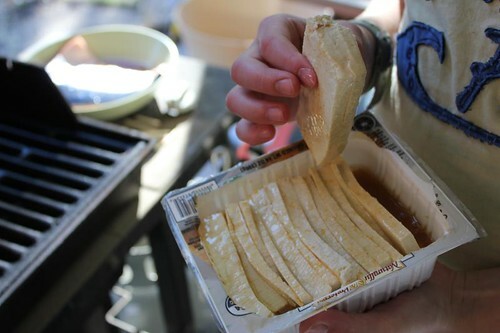 -Add the brown sugar, soy sauce and rice vinegar to the pan. Bring to a boil, making sure all the sugar is melted. -Remove from heat and let cool. 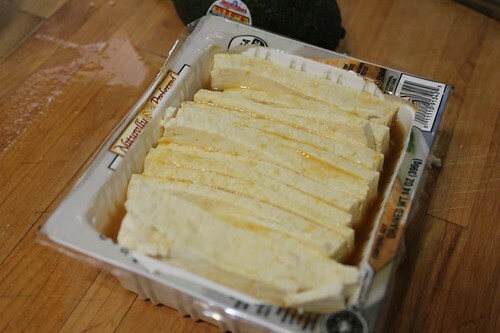 -At this point, we decided to put the tofu back into it's original container to hold some of the marinade (maybe a third). One less bowl to wash.
-After a half hour or so in the fridge, we poured some canola oil over them and brought the tofu and fish to the grill. -Cook over high-ish medium heat, flipping once, until nicely done (and a little crunchy on the edges). 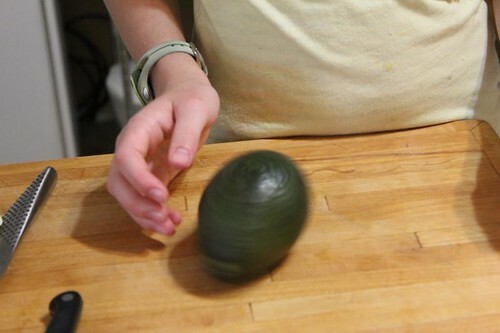 -Now spin your avocado around on the cutting board. Wow! That looks yummy! I'm going to have to try that... or go out for Japanese. Hmm! 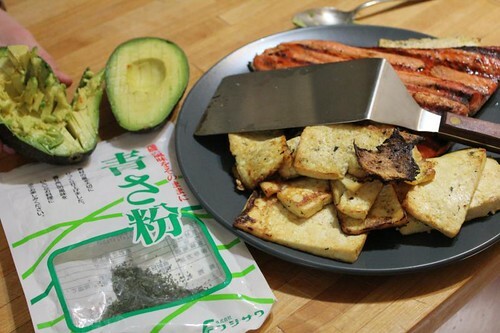 That looks so good I might have to torture Bubba with another shot at tofu. He still hates me a little for the one and only time I tried to pass it off as dinner. Finny, that's what the salmon's for. 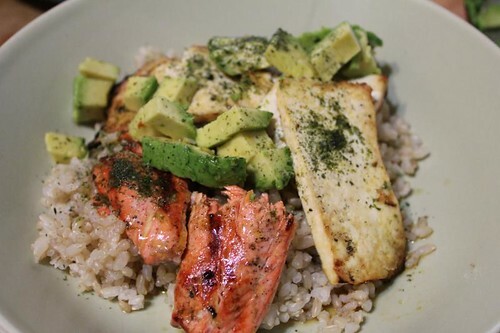 Protein backup. 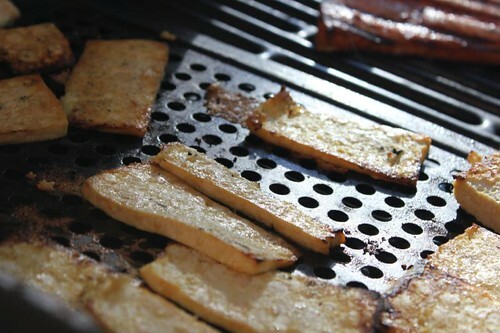 And marinading and grilling the tofu goes a long way towards making it palatable (better flavor and texture). I'd maybe leave it in the marinade all day.